European Captain Alison Nicholas and USA Captain Rosie Jones at the Opening Ceremony for the 2011 Solheim Cup at Killeen Castle. Photo Jenny Matthews/www.golffile.ieEuropean skipper Ali Nicholas scored a home run over US rival Rosie Jones before a ball was struck in the Solheim Cup. Jones confessed that the canny home captain had out-foxed her by not putting world No 2 Suzann Pettersen out first in this morning’s opening foursomes at Killeen Castle. Jones opted for firepower at the top of the order with big-hitting Hawaiian Michelle Wie and Cristie Kerr taking on Swedish pair Maria Hjorth and Anna Nordqvist. But Nicholas spread her strength throughout the team with Pettersen paired in the final match with Swede Sophie Gustafson against veteran Juli Inkster, 51, and Brittany Lang. The Americans are bidding for their fourth win on the trot and 9-3 lead in the fearsomely contested biennial matchplay tussle. But Europe has huge strength in depth for the first time in years against an American side that has seven players in the world’s top 20 to Europe’s one. The American side has won the last two matches by four-point margins but it’s Europe that boasts home advantage and a collection of in-form players. Eight members of the European team have won a total of 12 tournaments this season, including four on the LPGA tour by Pettersen, twice, Germany’s Sandra Gal and Sweden’s Maria Hjorth. In contrast, just two Americans have triumphed this year. Back as skipper after slumping to a 16-12 defeat two years ago, Nicholas said: “I think it helps that this is my second time as captain. The Americans have dominated the Solheim Cup thanks to their superiority in the singles. But England’s Karen Stupples says Europe’s strength in depth will make it a more even fight this time. Stupples said: “I think traditionally in the past the top players have had to have had a lot of pressure, because they know that their points are big. 0816 Brittany Lang and Juli Inkster versus Suzann Pettersen (Norway) and Sophie Gustafson (Sweden). 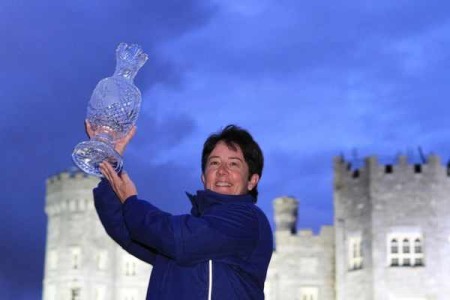 Solheim Cup skipper Alison Nicholas believes inspirational messages from Colin Montgomerie and Ian Poulter could give Europe an edge at Killeen Castle next month. Azahara Muñoz holes out ont he 18th to give Europe a crucial half in the final foursomes. Picture by Jenny Matthews/www.golffile.ieSpanish rookie Azahara Muñoz holed a crucial par putt on the 18th to help Europe extend its lead over the over the United States to 7-5 in the Solheim Cup at Killeen Castle today. Americans Cristie Kerr and Paul Creamer went one up on Muñoz and Scot Catriona Matthew in the final match of the morning foursomes when Kerr birdied the 17th from six feet. But the American bunkered her approach to the last and couldn’t save par from 12 feet, allowing the Europeans to halve the match with a winning par four and double the home side’s overnight lead to two points.